Headquarters Main Interior Building (MIB), Washington, D.C. The National Park Service is the United States federal agency that manages all National Parks, many National Monuments, and other conservation and historical properties with various title designations. It was created on August 25, 1916, by Congress through the National Park Service Organic Act. It is an agency of the United States Department of the Interior, which is a Cabinet Office of the executive branch, overseen by a Secretary, nominated by the President and confirmed by the Senate. Most of the direct management of the National Park Service is delegated by the Secretary to the National Park Service Director, who must also be confirmed by the Senate. In 1872 the United States government established Yellowstone National Park as the world's first national park. Forty-four years after the establishment of Yellowstone, the National Park Service was created as the result of lobbying by conservationists. Today the organization employs archeologists, architects, curators, historians, and other professionals in the care and preservation of more than 85 million acres of protected areas and nearly 400 national parks throughout the country. The national park system was established by those who understood the value of creation and man's responsibility to it. The National Park Service was the first organization of its kind in the world, and provides a living model for other nations wishing to establish and manage their own protected areas. Catlin’s vision had no immediate effect. In the east, romantic portrayals of nature by James Fenimore Cooper and Henry David Thoreau and painters Thomas Cole and Frederick Edwin Church began to compete with the prevailing view of wilderness as a challenge to be overcome. Slowly unspoiled nature and spectacular natural areas of the West became better known and the idea of saving such places gained interest. Yellowstone National Park was the first national park to be designated in the world, in 1872. There was no state government to manage it, so the federal government assumed direct control. Yosemite National Park began as a state park; the land for the park was donated by the federal government to the State of California in 1864 for perpetual conservation. Yosemite was later returned to federal ownership and designated a national park. Stephen Mather (center), the first director of the National Park Service, and his staff, 1927 or 1928. 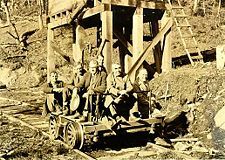 NPS Preliminary Survey party, Great Smoky Mountains, 1931. 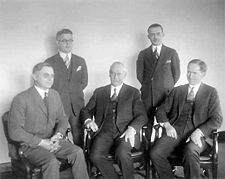 Joined by fellow conservationist J. Horace McFarland and journalist Robert Sterling Yard, they ran a publicity campaign for the Department of the Interior. They wrote numerous articles that praised the scenic qualities of the parks and their possibilities for educational, inspirational and recreational benefits. This campaign resulted in the creation of a National Park Service. 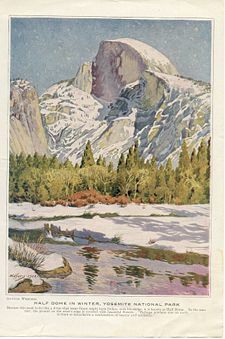 On August 25, 1916, President Woodrow Wilson signed a bill that mandated the agency "to conserve the scenery and the natural and historic objects and wildlife therein, and to provide for the enjoyment of the same in such manner and by such means as will leave them unimpaired for the enjoyment of future generations." Mather became the first director of the newly formed National Park Service. Later, the agency was given authority over other protected areas, many with varying designations as Congress created them. In addition to Mather, McFarland and Yard, others who promoted the creation of a separate agency to manage the National Parks and Monuments included: Secretaries of the Interior Walter Fisher and Franklin K. Lane; Presidents William Howard Taft and Woodrow Wilson; Frederick Law Olmsted, Jr.; Representatives William Kent and John E. Raker of California; Senator Reed Smoot of Utah; and Horace M. Albright. The National Park System is a term that describes the collection of all units managed by the National Park Service, and it is not necessary for the title or designation of the unit to include the term "park" - indeed most do not. The system encompasses approximately 84.4 million acres (338,000 km²), of which more than 4.3 million acres (17,000 km²) remain in private ownership. The largest unit is Wrangell-St. Elias National Park and Preserve in Alaska. At 13,200,000 acres (53,000 km²) it is over 16 percent of the entire system. The smallest unit in the system is Thaddeus Kosciuszko National Memorial in Pennsylvania, at 0.02 acre (80 m²). The System as a whole is considered to be a national treasure of the United States, and some of the more famous National Parks and Monuments are sometimes referred to metaphorically as "crown jewels". 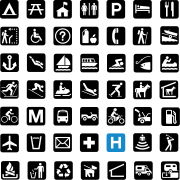 A sample of National Park Service pictograms. In addition to "units," and other properties that the National Park Service either owns or administers, it also provides technical and financial assistance to several "affiliated areas" authorized by Congress. The largest affiliated area is New Jersey Pinelands National Reserve at 1,164,025 acres (4711 km²). The smallest is Benjamin Franklin National Memorial at less than one hundredth of an acre. Although all units of the National Park System in the United States are the responsibility of a single agency, they are all managed under individual pieces of authorizing legislation or, in the case of national monuments created under the Antiquities Act, presidential proclamation. 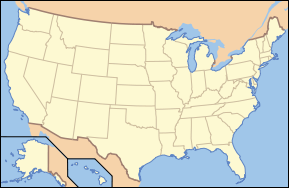 For example, because of provisions within their enabling legislation, Congaree National Park is almost entirely wilderness area, yet Yosemite allows unique developments such as the Badger Pass Ski Area and the O'Shaughnessy Dam within its boundaries. Death Valley National Park has an active mine legislated within its boundaries. Such irregularities would not be found in other parks unless specifically provided for by the legislation that creates it. Many parks charge an entrance fee ranging in price. Visitors can buy a federal inter-agency annual pass, known as the America the Beautiful – National Parks and Federal Recreational Lands Pass, allowing unlimited entry to federal fee areas including those under the auspices of USDA Forest Service, National Park Service, US Fish & Wildlife Service, Bureau of Land Management, and Bureau of Reclamation. National Park Service Headquarters are located in Washington, D.C., with regional offices in Anchorage, Alaska, Atlanta, Georgia, Lakewood, Colorado (outside of Denver), Omaha, Nebraska, Oakland California (San Francisco Bay Area), Philadelphia, Pennsylvania, and Seattle, Washington. The National Park Service Southwest Regional Office (also known as National Park Service Region III Headquarters Building) in Santa Fe, New Mexico is a masterpiece of Spanish/Pueblo revival architecture and was itself declared a National Historic Landmark in 1987. The National Park Service operates four archaeology-related centers: Harpers Ferry Center in Harpers Ferry, West Virginia, the Midwest Archeological Center in Lincoln, Nebraska, the Southeast Archeological Center in Tallahassee, Florida, and the Western Archeological and Conservation Center in Tucson, Arizona. The Harpers Ferry Center specializes in interpretive media development and object conservation. The other three focus to various degrees on archaeological research and museum object curation and conservation. Training centers include: Horace Albright Training Center, Grand Canyon; Stephen Mather Training Center, Harpers Ferry, West Virginia; Historic Preservation Training Center, Frederick, Maryland; and Capital Training Center, Washington, D.C.
Old Faithful Geyser in Yellowstone National Park, the first designated national park in the world. The National Park service manages more than 20 various types of units. The best known are the National Parks and the National Monuments. National Parks include a range of superb natural and cultural wonders. The first National Park was Yellowstone National Park, 1872. National Monuments preserve a single unique cultural or natural feature. Devils Tower National Monument was the first designated, in 1916. National Historic Sites protect a significant cultural resource that is not a complicated site. Examples of these types of parks include: Ford's Theatre National Historic Site and William Howard Taft National Historic Site. National Historical Parks are larger areas with a more complex subject. Appomattox Court House National Historical Park was created in 1940. George Rogers Clark National Historical Park was dedicated in 1936. Historic sites may also be protected in National Parks, Monuments, Seashores, and Lakeshores. National Military Parks, Battlefield Park, Battlefield site, and Battlefield preserve areas associated with military history. The different designations reflect the complexity of the event and the site. Many of the sites preserve important Revolutionary War battles and Civil War Battlefields. ‘Military Parks’ are larger actions such as Chickamauga and Chattanooga National Military Park or Vicksburg National Military Park, Gettysburg National Military Park and Shiloh National Military Park, the original four from 1890. Examples of ‘Battlefield Parks’, ‘Battlefield Sites’, and ‘National Battlefields’ include: Richmond National Battlefield Park, Brices Cross Roads National Battlefield Site, and Antietam National Battlefield. National Seashores and National Lakeshores offer both preservation of the national coast line, while supporting water based recreation. Cape Hatteras National Seashore was created in 1937. Indiana Dunes National Lakeshore and Pictured Rocks National Lakeshore were the first to be created in 1966. National Rivers and Wild and Scenic Riverways protect free-flowing streams over their length. The riverways may not be altered with dams, channelization or other changes. Recreational pursuits are encouraged along the waterways. Ozark National Scenic Riverways was established in 1964. Not all of these units are part of the National Park System. The U.S. Forest Service, the Bureau of Land Management and other government agencies also manage wild and scenic rivers. The National Trails System preserves long distance routes across America. The system was created in 1968 and consists of two major components. National Scenic Trails are long-distance trails through some of the most scenic parts of the country. Scenic trails received official protection in 1968. The Appalachian Trail and the Continental Divide Trail are the best known of these trails. National Historic Trails commemorate the routes of major historic events. Some of the best known trails include: the Trail of Tears; the Mormon Trail; and the Santa Fe Trail. National Preserves are for the protection of certain resources. Activities like hunting and fishing and some mining are allowed. Big Cypress National Preserve and Big Thicket National Preserve were created in 1974 as the first National Preserves. National Reserves are similar to National Preserves, but the operational authority can be placed with a local government. City of Rocks National Reserve was the first to be established in 1988. The table below details type of unit, number of, and acreage within, each unit. The United States Park Police is a distinct law enforcement division of the National Park Service, with jurisdiction in all National Park Service sites, but primarily utilized in the Washington, D.C. metropolitan area, New York City, and Golden Gate National Recreation Area in and around San Francisco. Law enforcement services in other NPS units are provided by specially commissioned park rangers. Other special NPS divisions include the Historic American Buildings Survey, National Register of Historic Places, National Natural Landmarks, the Rivers, Trails, and Conservation Assistance Program, the Challenge Cost Share Program, the Federal Lands to Parks, the Hydropower Relicensing Program, the Land and Water Conservation Fund, the National Trails System, and the Partnership Wild and Scenic Rivers Program. In an effort to increase visitation and allow for a larger audience to enjoy national park land, the National Park Service has numerous concession contracts with private businesses to bring recreation, resorts, and other compatible amenities to their parks. National Park Service lodging opportunities exist at places such as Wawona Hotel in Yosemite National Park and the Fort Baker Retreat and Conference Center in Golden Gate National Recreation Area. "Adaptive reuses" like those at Fort Baker have raised some controversy from concerns over the historical integrity of these buildings after such extensive renovations, and whether such alterations fall within the spirit or the letter of the preservation acts they are protected by. In addition, many Park Service sites include bookstores operated by a non-profit cooperating association. The largest example is Eastern National, created by charter in 1948, to "provide quality educational products and services to the visitors to America's national parks and other public trusts." Eastern National runs bookstores in more than 130 national parks and other public trusts in 30 states. From its inception through 2008, the bookstores have donated more than $95 million to the National Park Service and have provided a wealth of educational programs and materials. ↑ Eastern National. 2008. Eastern National Mission & Purpose Retrieved November 17, 2008. Everhart, William C. 1972. The National Park Service. Praeger library of U.S. Government departments and agencies, no. 31. New York: Praeger Publishers. Ise, John. 1961. Our national park policy: a critical history. Baltimore: published for Resources for the Future by Johns Hopkins Press. Lee, Ronald F. 1972. Family tree of the national park system; a chart with accompanying text designed to illustrate the growth of the national park system, 1872-1972. Philadelphia: Eastern National Park & Monument Association. Mackintosh, Barry. 1991. The national parks: shaping the system. Washington, DC: U.S. Dept. of the Interior. National parks for the 21st century: the vail agenda. 1991. [S.l. ]: Nat'L Park Fndn. Moffet, Ben, and Vickie Carson. 1994. National Park Service almanac. [Denver, CO]: National Park Service. Udall, Stewart L. 1963. The quiet crisis. New York: Holt, Rinehart and Winston. History of "National Park Service"
This page was last modified on 9 November 2018, at 18:11.